You can purchase 1-4 copies of the MiniVet Guide by adding to the cart below. Chose the Complete Flashcards Set or MVG Ultimate Set and save $7. Grab friends and colleagues to organise an order of 5+ of each product, for bulk and postage discounts. Email gerardo@minivetguide.com for more info. The MiniVet Guide is a small easily portable booklet containing what you need to know to get you through everyday presentations. It is designed to help students through their final year of rotations as well as aid new veterinarians through their first years of clinical practice. It contains information about common presenting conditions in a simple and concise format. From treating a straightforward case of gastroenteritis to working through a complex Addisonian crisis, the MiniVet Guide has it covered. The flowcharts help direct you down a pathway towards a diagnosis while the individual chapters provide more information about common differentials. It is a perfect study companion for final exams, a great reference for practical rotations and will be your backup to get you through busy consults. The MiniVet Guide is there to make our veterinary careers a little easier. It is not just a book- it’s a lifesaver! This is basically my go to primary resource as a busy small animal veterinarian, it’s got the information I need to handle 95% of all cases that walk in through the door. The drug charts are such a wonderful time saver! This book is really amazing, whether you need to know something concretely, or just read through it out of interest, you’ll definitely be amazed by its simple yet effective way of giving you exactly what you need, as easy and as fast as possible. I just received it and I cant stop reading, its just too addictive to put aside. Its so much valuable information, put together in such an incredibly compact way, you’ll be amazed with every page! If you are a vet or especially vet student, this one is just the right thing for you. The best resource ever. I have used this book so often that I’m now just about to purchase my third copy of it as I’ve worn out the pages from using it every single day. I graduated 3 years ago and am still in love with the book. It’s handy and has got everything you need to know in easy to understand descriptions and step by step diagnosis, management and treatment plans for endless diseases! Could you please consider using Amazon Kindle or iBooks? Hi Matthew, thanks for question. It is something I would love to do, although probably it is 1 to 2 years away! Para Venezuela es posible su compra? que via se utilizaria? Is it possible to buy in Venezuela? What are the means of purchase for my country? I joined the meat industry soon after graduating and last year, at age 51, developed a very late interest in dog and cat matters, just to keep the old grey matter ticking over. 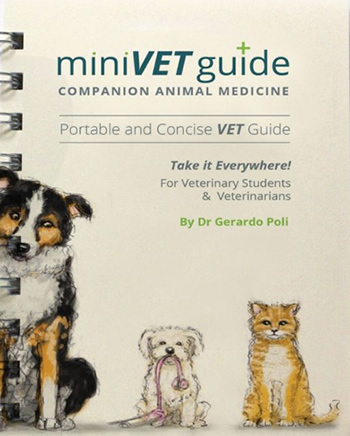 A final year vet student told me about the mini vet guide so l bought a copy. I’ve spent many hours since poring over the contents and hope to do a little volunteer work in the coming years. I wish the book was around 30 years ago – it would have been better than studying my scribbled foolscap lecture notes! Is it possible for me to buy it , I am from Philippines? Thanks Doctor! Hope to meet you in the future! Hi yes of course you can buy, I ship worldwide. Just head to shop/buy page and complete your details. It should take around 2 weeks to arrive! If there were some friends to buy with them I offer bulk discounts from 3 books – email me on gerardo@minivetguide.com for more info. Is it available in bookstores? Is this from Australia or New Zealand? Thank you! This book is honestly amazing – I’ve been using it since almost the start of my veterinary degree and it’s definitely my most used book. It literally has pretty much everything you need to know for small animal VIVAs and integration exams, and really helps with your base understanding in first and second year. I’m about to enter my final clinical year and I’m sure it will be invaluable for years to come! How long will it takes for shipment if i order now? I’m in NSW. You can purchase 1-4 copies of the MiniVet Guide Ultimate Set by adding to the cart below. Save $7 when purchased as a set. 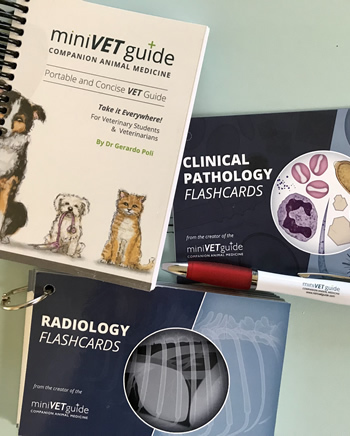 The ultimate veterinary educational pack containing the MiniVet Guide, Radiology Flashcards, and the Clinical Pathology Flashcards and pen. These resources are designed to make a vets life easier, pocket-sized, concise and clinically focused they are the perfect companion for small animal practice.